Light has been a tool for investigating matter for many years. It is fascinating that we can now modify and create new matter with light in a phenomenon known as strong light-matter coupling. 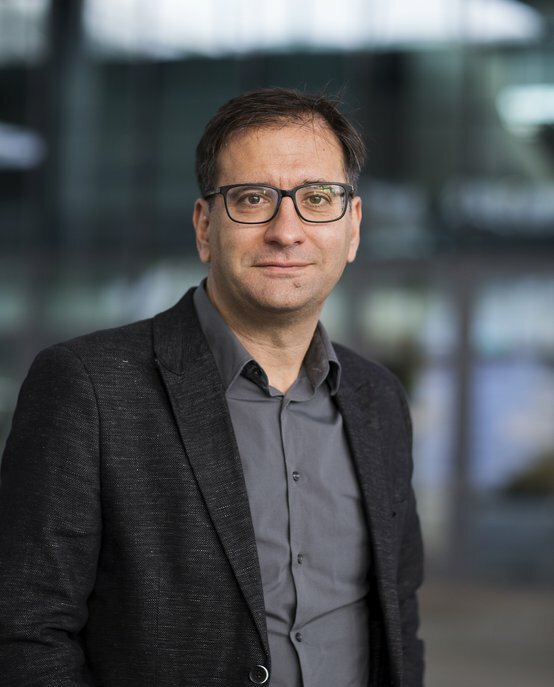 Jaime Gómez Rivas is a full professor and chair of Surface Photonics in the department of Applied Physics, Eindhoven University of Technology (TU/e). His areas of expertise include electromagnetism, optics, nanophotonics and THz photonics. The group of Gomez Rivas works on strong light-matter coupling at optical and THz frequencies and the potential applications of this phenomenon in optoelectronics. The research is mainly experimental, focusing on resonant nanostructures that can maximize the coupling strength. Jaime Gómez Rivas received his PhD in 2002 from the University of Amsterdam for his work on light transport in disordered media. From 2002 until 2005, he worked as postdoctoral researcher at the RWTH technical University in Aachen (Germany) on THz spectroscopy, pioneering the field of semiconductor THz plasmonics. In 2005 he became project leader at the FOM Institute for Atomic and Molecular Physics (AMOLF), leading the group Surface Photonics. This group was partially located at Philips Research in Eindhoven, in order to bring blue sky research into applications. The group introduced the concept of plasmonics and nanoantennas for solid state lighting. In 2010 Gomez Rivas became part-time professor at TU/e and group leader at AMOLF. After 10 years of fruitful collaboration with Philips, his group moved in 2015 to the Dutch Institute for Fundamental Energy Research (DIFFER) and in 2018 Gomez Rivas’ group moved completely to TU/e, where he is now full professor. Gomez Rivas has received several prestigious grants and awards, such as ERC starting and Proof of Concept grants, NWO-VICI, FOM-IPP and Facebook Academy Award. He has been also panel member of prestigious funding agencies, such as NWO and ERC. Gomez Rivas is also associate editor of the Journal of Applied Physics, a leading journal of the American Institute of Physics.